Over 40 years ago, as the result of a chance meeting in a campground on the South Branch of the Michigan's Au Sable River, Castwell and I began an odyssey that profoundly changed the course of both of our lives. The exact details of our first meeting are best left unspoken, but over the course of time we discovered that we both shared many similar interests; fly-fishing, duck hunting, archery, camping, and photography – and most anything else connected with the outdoors. Thus began an adventure that would ultimate lead us to leave Michigan for Montana, as much for the hunting and fishing as for any other reason. The early 60's were the end of the Dark Ages of fly-fishing and the beginning of the Renaissance, and we arrived on the scene just in time to ride the first wave. Fly fishing had fallen onto hard times during the war years, and after the end of World War II the latest craze, spin fishing, had nearly driven fly fishing into extinction. Books on fly fishing were nearly impossible to find, Orvis and Leonard were the only two manufacturers of quality fly rods, [an Orvis Battenkill Bamboo fly rod, 2 piece with extra tip, in a cloth sack and aluminum case sold for $90.00 American], Joe Brooks was the reigning fly fishing guru, and Dan Bailey's Fly Shop in Livingston, Montana was the Mecca for fly anglers. With little to guide us we tore into fly-fishing like two starving wolves on a bison carcass. For the next several years we ate, drank, dreamed, and lived fly-fishing. We had basements and spare rooms filled with all the accoutrements associated with fly-fishing. We had aquariums filled with mayflies, stoneflies, caddis larvae, and midges. Escapees fluttered through our homes during the dead of winter, midges danced around our table lamps, and mayfly spinners threw themselves against our windowpanes in a vane attempt to gain their freedom to dance over some imagined trout water. We photographed our hatching bugs, we examined them under microscopes, and we poured over entomology textbooks, and learned to speak a new language with words like Tricorythodes, Brachycentrus, Ephemerella, and Siphlonurus. We became field testers, taught seminars, wrote articles, joined organizations, tied flies, and told lies, and through it all we fished, and fished, and fished. Each weekend from April to September, like religious pilgrims on a quest, we made the trek to the Au Sable River. We camped in tents, trailers, in the back of cars, and sometimes we even slept on the ground. We grabbed a quick breakfast and were gone for the day, and long after the evening sun had set behind the jack pines on the distant hills evening meals frequently consisted of hot dogs cooked over a campfire while we rehashed the days fishing. It was nearly 200 miles from my doorstep to the campground on the Au Sable, and with any good luck I could cover that distance in less than 3 hours! We fished in the rain; we fished in the snow, during hatches and when not a single bug was visible. We drove over snow covered roads to fish for spring steelhead, sat for hours waiting in the growing darkness for a spinner fall of Hexegenia limbata, tied flies by the light of a Coleman lantern, fished from dawn to dusk, and fell into bed exhausted but happy. In the early 70's on a whim we drove nonstop over 1800 miles to spend 10 days fishing the fabulous and fabled trout streams of Montana, Wyoming and Idaho. We truly were driven. In the process we made fly-fishing our own. What we knew, we learned by experience, by literally putting our nose in the water to see what the trout saw, and to came to know why things were the way they were, often by the process of trial and error. We had the time of our lives, and unfortunately we failed to realize that it was all passing away. Today's angler knows nothing of such times. The information and skills that we honed by trial and error are for sale at the local bookstore, through fly-fishing seminars, and trendy fly shops. Theirs is a sport that is market driven, and today's 'must have rod' is obsolete before it arrives via overnight UPS. Fishing has become not a means to an end but an end in itself. We still fish, but the adventure and joy of discovery has faded. 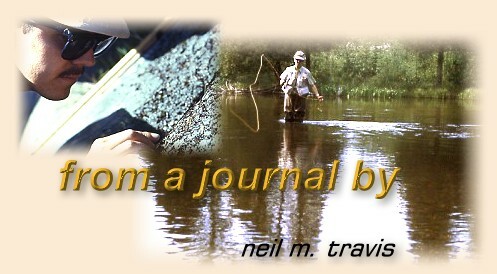 There are books that contain all the answers to fly-fishing's greatest mysteries, flies that mimic every stage of an insects life, equipment the likes of which we could not imagine 40 plus years ago, and instant access to information about current hatches and stream conditions nearly anyplace in the world via the worldwide web. As for us, the friends that we knew, the adventures that we shared are relegated to a time and place that is now far away, and to whence we cannot return. In the process of becoming we lost something along the way, perhaps we lost ourselves. We must accept some degree of responsibility for the present world of fly-fishing consumerism for we created a need, and the world was all too happy to meet it. Like Pandora we opened the box, and we can never again close the lid.